Bigger is not always more beautiful when it comes to architecture. Nir Pearlson's energy-wise Plan 890-1 proves it. A rather ho-hum name for Fine Homebuilding Magazine's top pick for Small Home Plan of 2013. So how small is it? 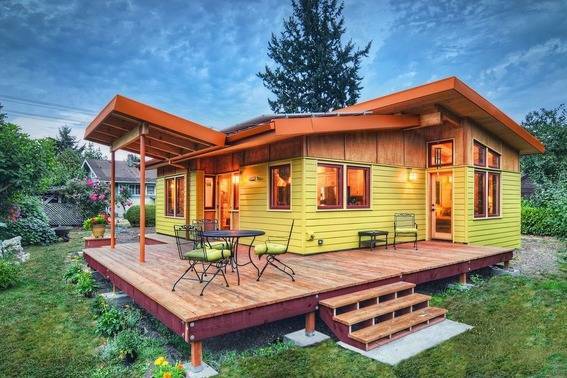 Eight-hundred square feet, but the open living space inside makes it seem much larger than its tiny footprint. The two bedroom, one bathroom 'garden cottage' oozes a modern/rustic charm both inside and out. Now for a peek inside. For more details about 890-1 or to buy plans (starting at $825) visit Houseplans.com. For more information about Nir Pearlson, click here. Two dead corners in the kitchen? What a cozy lake house. Looks like a really cozy one or two person house. I would probably look at turning the guest room into a small office in the left half and a small powder room with just toilet and sink to the right--basically 5'x5' backing up to the W/D closet. A single door would open into that powder room from the entry, and another door to the office from the entry. Then, I would have the door for the full bath off of the master bedroom. I would add a door from the master bedroom to the bath (as well as the door from the hall that is already on the plan). The only other suggestion is to give an option for a separate master bath. Otherwise, the plan looks very livable without wasted space.